In 11 days time, I will be attending my 3rd Olympic Games. I am super stoked to have come full circle, after competing in 2008 for South Africa in the Women’s K4 and K2 events (making the final in the K4) and then being in London with Bridgitte Hartley (my K2 partner from Beijing, I helped her by being a training partner in the lead-up to London 2012 where she medalled in the WK1 500m event) and now going into the Rio Olympics as Team USA Olympic Coach to my athlete, Maggie Hogan. It’s kind of cool seeing the sport from so many different angles, and I am very excited about this next phase of my career. It’s 11 days until the opening ceremony, and we have a lot going on before then! I was just in Portugal (possibly my favorite country!) I was just recovering from my jetlag (we were there in June for the 3rd Canoe Sprint World Cup – where Maggie got a silver medal in the 5k) and all of a sardine-tin found myself back on a plane heading across the globe. I can’t say I was upset at having to return to Portugal… Great wine, pastel de natas and cooking downwind! The Nelo Summer Challenge is one of the best events on the World Series, and is also an ICF World Cup race. Thanks Macca Hynard for the cool photo! As usual, Andre, Marisa and all their team staff put on a spectacular event. The wind delivered and we had great conditions for racing. Schoogirl error on my part cost me my 5th NSC title, as I casually jogged up to the finish line not realizing that Angie Mouden had caught up to me as I played it cautious through the surf zone. Great race Angie, and good to see some younger talent coming through. I managed to sneak a last-minute trip to Hood River for the Gorge Downwind Champs. Strangest thing, doing a downwind on a river! A lot of fun, and we caught a good day of cracking wind on Thursday and again on Saturday. Unfortunately race day (Friday) was pretty flat, and didn’t quite go how I would have liked. 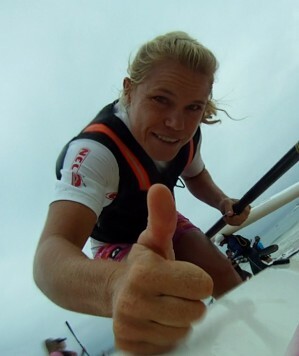 Teneale Hatton showed her strength on the flatwater to paddle away from the women’s field to take the win. Great to see so many good female paddlers from all over the world taking part (NZ, Australia, Spain and USA). The whole team behind the event, led by Energizer Bunny Carter Johnson, put on a great few days. Seamless downwinds with a daily, repeating shuttle, a beer garden, and great food all made for a fun break! Go Team USA & Team South Africa!